Julie Davila is a member of the chamber percussion ensemble the CAIXA TRIO. In addition to her membership in the CAIXA TRIO, she has served as the chair of the Percussive Arts Society Marching Percussion Committee and is the founder and executive director of Percussion XS, a dynamic new honors percussion group featuring middle and high school students. 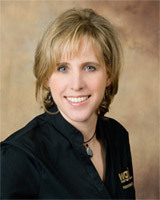 Prior to Julie launching Percussion XS, she was the percussion specialist at several high schools in Nashville, Tennessee. Many of her groups have medaled in all divisions of the WGI activity and in 1996 the John Overton High School Indoor Drum Line, under her direction, won a National Championship. Julie has recently joined the nationally recognized adjudication team for WGI. As a member of the CAIXA TRIO and as an active clinician specializing in contemporary and marching percussion, she has performed in Seoul, South Korea, Paris, France, Puerto Rico and extensively throughout the United States. Julie received her degree from the University of North Texas. She has published numerous marching and concert percussion features through Row-Loff Productions and Drop6 Media. She is the author of the “Modern Multi-Tenor Techniques and Solos” and “Impressions on Wood” published by Row-Loff, and is a co-author of “Aptitude”, an innovative solo snare book published by Drop 6 Media. Julie is an endorser and clinician for the Pearl Corporation, Innovative Percussion, the Avedis Zildjian Company, Grover Pro Percussion, and Evans Drum Heads.